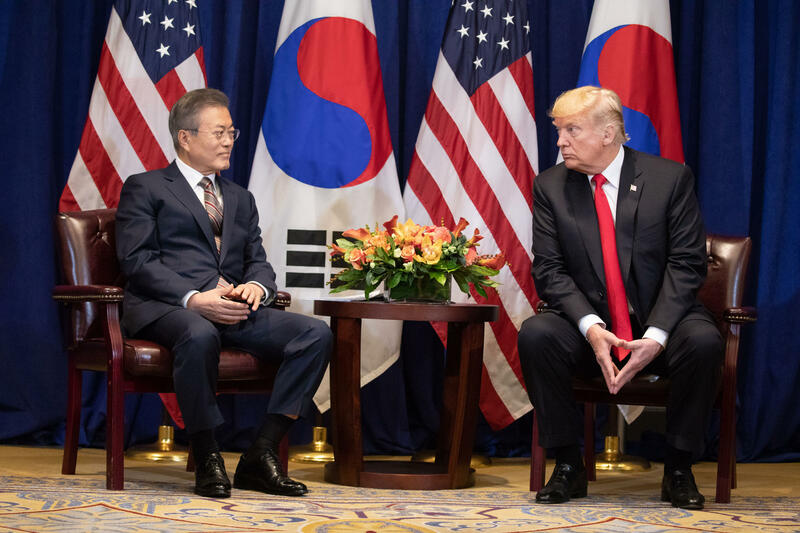 President Donald J. Trump and Moon Jae-in, President of the Republic of Korea, participate in bilateral discussions Monday, Sept. 24, 2018, at the New York Palace hotel in New York City. It’s been about six weeks since President Trump and North Korean leader Kim Jong Un ended their summit in Vietnam without any agreement, and with no apparent progress from their previous meeting in Singapore last June. South Korea’s president has tried to play a role encouraging talks between the United States and North Korea. According to South Korean media reports this week, he’s likely to ask President Trump to ease some sanctions on Pyongyang. On Monday, South Korean businesses at the Kaesong Industrial Complex held a news conference in front of the U.S. Embassy in Seoul — calling for an exemption from sanctions for that project that has in the past served as an economic cooperation zone between the two Koreas. But any exemptions from sanctions without progress on denuclearization would be a departure from U.S. policy. Meanwhile, international enforcement of sanctions against North Korea continues as a matter of course — including targeting of illegal ship to ship transfers of fuel designed to get around the rules. Events to watch on the North Korean side include a scheduled national address by Kim Jong Un before the Supreme People’s Assembly, opening later this week. And in another development, the China Daily reports this week that Kim is likely to visit Russia “in the near future” for what would be his first meeting with Russian President Vladimir Putin.